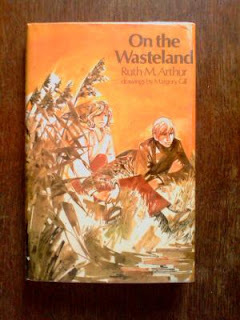 I was so sure that On the Wasteland, by Ruth M. Arthur, illustrated by Margery Gill, would finally be the book of hers that I truly loved. The plot hits all the right notes for me. The heroine, Betony, is a smart, orphaned girl drawn to the lonely wasteland at the edge of the Suffolk coast, and happily for her the orphanage gives her freedom to wander around in it alone (nice orphanage!). She makes friends with the old couple whose house is an overturned boat (this isn't something I actually look for in books, but it is a nice touch). This friendship leads her to working part time in the manor house (for which I give it bonus points) where she's given the run of the library (lots of bonus points). And there's the handsome teenaged grandson of the lady of the manor, with romance to come hinted at (this would have gotten more bonus points back when I was a young teen myself. Hardened cynical me rolls eyes, but in a kind way). And on top of all that, there's a time slip plotline--in the Wasteland, Betony is sometimes swept into the past, when Vikings were settling in Suffolk (not exactly invading, but not invited by the Saxons either, so not peaceful). At first she is just an observing shadow, but as she grows from child to teen, her immersion in the past becomes deeper, and the Vikings start to see her, and she steps into the role of Estrith, a girl her own age. Her Viking family starts to matter more and more to her, though the past is sometimes disturbing. It is also disturbing that there have been quite a number of people before Betony who were found drowned in the Wasteland. 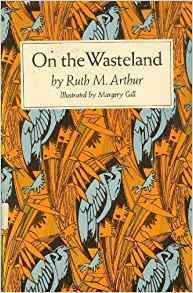 So I should have loved this book to pieces, but once again Ruth M. Arthur failed to deliver that for me, and I ended up simply enjoying it quite a bit. In this case, it is because Betony is narrating the story from a future point of view (for instance, she checks her journal to make sure she's remembering things the way they happened). So it's clear that we, the reader, aren't living it with Betony; she's telling us a story that she already lived through, with lots of flashbacks. And this lack of immediacy and lack of closeness made me not care as deeply about her and her world as I might otherwise. The other issue is that, except for the threat of drowning hanging over the time travel, the time travel doesn't do anything much to advance the story or Betony's character arc. The only noticeable result is that she decides to be an archaeologist/early medieval historian. I like a nice bit of "time travel as tourism" but to be really good time travel, it needs to accomplish something other than provide a bit of family time and some career counseling. And when it is floaty magic sort of time travel like this, I really like it to have some emotional hook to the present that gives a reason for it be happening over and over again beyond "there were Vikings here once." The only hook here was that Betony was a Suffolk native yearning for family connections, which doesn't much explain why it was Vikings and not 18th century farmers. Oh well. Like I said, though, I did enjoy it; it was a pleasant read. And there was one part I found especially cool--I myself have family who came from Suffolk to Virginia in the 17th century; they were Knotts, and one of the characters in the book is surnamed Nott, and they talk about how that is one of the local Viking lineages. However, I spent a summer in Suffolk (on an archaeological dig at Sutton Hoo), and didn't time travel one single bit, even when lying on top of a burial mound floating like an island in the night mist, so Betony wins, even though I am just as much Viking as her. I stuck both middle grade and YA on it as lables for this post; it's suitable for both ages, although they'll get different things out of it--starry eyed wonder of time travel and romance vs. story of a lonely cranky teenager. The cover at the top of the post is from the Goodreads edition it doesn't really fit the book much at all. Why have Margery Gill as an illustrator if she doesn't do a cover with people? Having typed that, I checked the cover of my edition--rather unappealing 1970s teenage love--turns out to be in fact by M.G., which just goes to show. I absolutely love the cover, but I think I'll take a pass on a "not quite there" book. Thanks for a very thoughtful review. How did I not know that Ruth Arthur has failed you? Have you read them all? I am trying to think which is my favorite. The Saracen Lamp? The Autumn People? I feel like jumping in my car and heading down 95 to hand deliver a book or two! I do love Margery Gill, almost as much as Victor Ambrus. I've read about five, including The Autumn People. Not the Saracen Lamp yet though....I'm going to keep trying her, because she really seems like the sort of author I should love!